I just finished giving a presentation at our state’s annual music educator convention, followed by very short speaking engagements in a few other places. I have spoken to large groups of people for many years, and each time I speak it gets easier. I wasn’t always this comfortable speaking in public; in fact, I used to get horribly nervous. 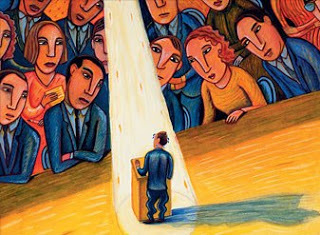 After all, the fear of public speaking is said to be the second most popular fear, probably after the fear of death. But I believe that any determined person can learn the art of public speaking. I hope this post will show beginners how to venture into public speaking. I constantly watch other speakers and learn from them; both live and on YouTube. You can also google “free online speaking courses” and some cool stuff will come up. The more you stare at who you want to become, the better chance you have at success. If you are speaking in public, most likely you are in the position to help people. A few days ago I helped teachers learn how to teach the trombone to kids. Although I will never “arrive” as a master teacher, I know my stuff. I also spoke to groups of people about giving money to certain causes that I find important. I needed to able to answer any questions about the organizations asking for money (and there were many). The only way for people to take you serious when you speak is to know your subject inside out, so study it like mad. If you’ve chosen to talk about finances, read just about any book and blog you can find on the subject. Become an “expert” and people will take you seriously. As a beginning public speaker, visualization can really help you. Visualization is a really powerful concept if done right. Just sit still and begin playing images of you speaking before thousands of people. Visualize yourself being applauded, visualize yourself speaking confidently and powerfully. Build these mental images and over time, you’ll realize you can speak any where, before anybody, without fear or stage fright. Nothing is worse than watching someone speak awkwardly with a PowerPoint presentation. Learn how to use a flip chart, PowerPoint presentation, projectors, etc. Learn to use a microphone and index card. Run your presentation to friends and family; record yourself, both audio and visual; talk to yourself in the shower or the car. Wash, rinse, repeat. No matter how large the crowd, maintaining eye contact, speaking energetically, speaking passionately and speaking from the heart is key. I try to use humor when possible (although I have bombed a bunch with jokes as well). When you see someone nodding their head while you speak, look at them and recognize them with a smile! I still get butterflies before speaking in public. However, you can turn the butterflies from fear into healthy anxiousness. Prepare yourself to the max, do some breathing exercises before you speak, and understand that every speech gets easier and easier over time. Good luck!